Each look he creates gets everybody fascinated right after the first glance. His style is so inherently spick-and-span but at the same time always enticing and unique. It couldn’t be otherwise because he’s showing off the best example of an amazing style and a strong personality all in one. As Mariano says he is simply having fun making his awesome fashion blog suggesting thousands of people the right way to dress up for all the occasions. We surely trust the very first Italian blogger and one of the most influential fashion personalities. The Fashiongton Post: Mariano, first of all we would like to ask how come you got such amazing fashion flair, have you been working hard on it or is it just a gift and your own unique vision? 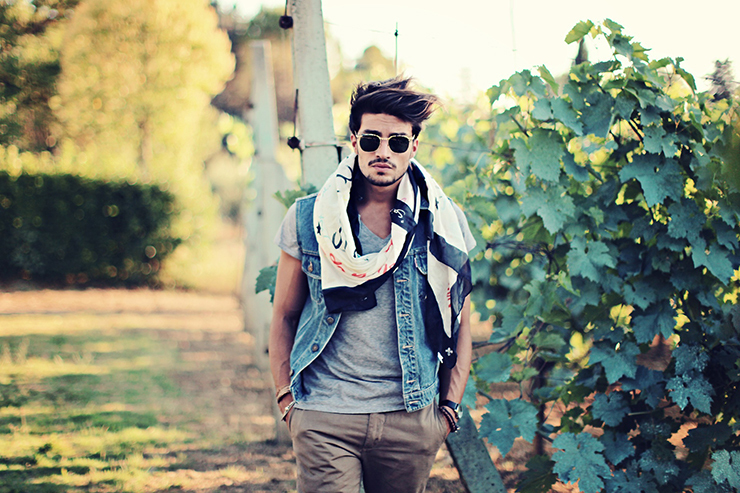 Mariano Di Vaio: This is such a hard question to start with, because I really can’t tell. I mean, I would say that my fashion flair has grown with me, during the years I realized I was taking care of it more and more maybe because I moved to different cities and I had the chance to compare such different styles. F.P. : Tell us what did this whole MDVstyle idea start with? What are the main conception and the major audience of the blog? MDV: Basically, the MDV style idea’s grown up to be a style guide for guys like me, for people who always want to be chic but cool at the same time. I guess what we all try to do is to be unique, and I try to help people doing it just sharing my fashion tips, and I’m happy because I see people visiting from all over the world everyday asking me stuff on Facebook and that’s the best feedback ever. F.P. : Who form your team? Who do you collaborate with these days? MDV: The cool thing about my “blog” is that I’m also a model and that means I work with different photographers and different people every week and I’ve the chance to see lots of different clothes and new collections. I guess that’s what makes my blog be great, I hope so (smiling). Of course the biggest thanks goes to my girlfriend Eleonora that always support me in everything. F.P. : So when has the transformation from a model to the street style fashion blogger occurred? Would you, please, share some of your model experience with us? Who did you manage to work with? MDV: It never happened actually because I still work as a model; in fact I’m currently working with one of the biggest agencies in Europe such as the “D’men” in Milan, and for brands like Roberto Cavalli, Brunello Cucinelli, Salvatore Ferragamo, and many others. F.P. : What has New York Film Academy changed in your life? What goal did you pursue by making the decision to study in it? MDV: Well, acting has always been my passion and going from Italy to New York just for studying was a big step for me, and it was a big expense for me to deal with also but I can say it was one of the best periods of my life, and I’m still studying it. F.P. : How would you define the Italian style? What does this term include and require for? F.P. : Where do you like to go at your free time? Are there any favorite spots in this world for you? MDV: I love to lie down on the ground in the sun and watch the sky, wherever I am and in whatever I wear, it’s the thing that relaxes me the most…and if possible some classic music never hurts! F.P. : What’s your “must have” for the spring season? Are there any special items you use the most nowadays? MDV. : Spring summer is the “#everythingisallowed” season, I mean double breasted suit with a t-shirt, even a parka, shorts or boots, I mean it depends if you are a person who’s sensitive to the cold or not. My only must have is sunglasses now and ever. F.P. : Tell us more about your basic life principles! How would you describe yourself? MDV: I’m a person with strong principles! I believe in God and I believe that the best things come to those who work they’re asses off, I believe in respect people who knows what they’re talking about, I believe sometimes you’ve got to turn the other cheek. F.P. : Who represents the most powerful example and the most influential person for you? F.P. : What songs are in your play list? F.P. : What does the success depend on? What has changed in your life since you became one of the most seen and respectful street style bloggers? MDV: Do what you want as long as you feel comfortable with it. That’s my primary and only rule. F.P. : Who are your favorite fashion designers? Have you ever been thinking of creating your own clothing line? What kind of collection would it be? MDV: My favorite things are vintage, so my favorite designers are all dead I guess. Yes, I’ve thought about my personal MDV-line but I still have not figured out what it would be about, maybe blazers, shoes and some sweatshirts. F.P. : Tell us more about your sport life, what are your favorite activities and are there any preferences in food? MDV: I go to the gym three times a week (when I can) and of course I have my personal trainer Alessandra Settemebre who’s one of the best in Italy and I actually eat everything as long as it’s not fried and it’s not chocolate. F.P. : What is fashion for you? Is there anything you would recommend to the beginners in the model industry? MDV: Fashion is just a way to describe my feelings; I usually wear sweatpants when I feel strong for example and bright colors when I’m happy… No, no big tips really, just work hard and you’ll reach your goal! F.P. : Please, describe your common day for us? MDV: My common day is full of phone calls, full of e-mails and full of work, but also full of happy moments with my friends and family. F.P. : Can you wish something for our readers? MDV: Of course, I wish you all the best (laughing).